Circles have their own set of guidelines that are essential for them to function well. 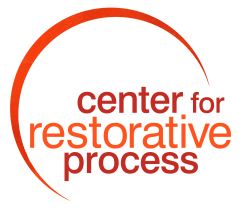 This lesson introduces those guidelines and begins the process by which students will become skillful participants in circles. Understand reasons for being in circle. 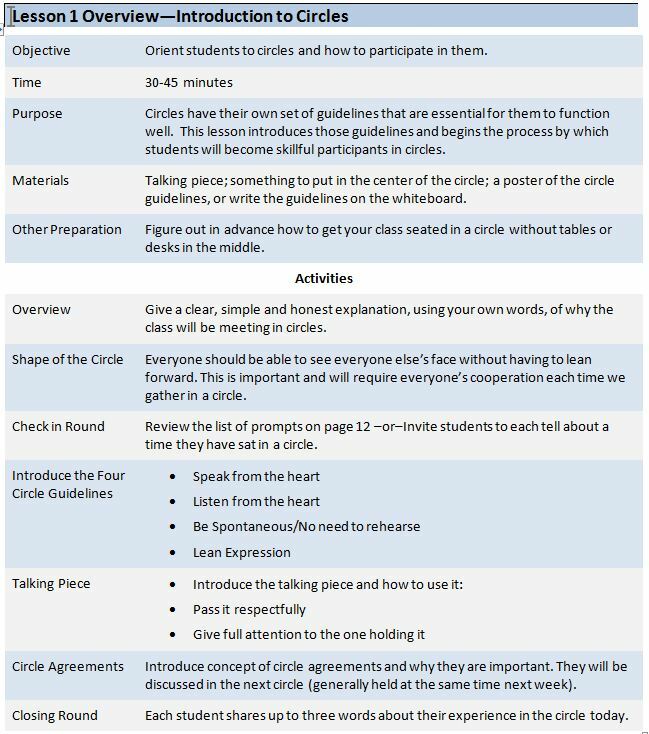 Know a functional definition of the shape of a classroom circle. Learn the four circle guidelines. Learn how to use a talking piece in the circle. Figure out in advance how to get your class seated in a circle without tables or desks in the middle. You will need a talking piece. Examples include a small, soft toy; a special stick or stone; a rattle or gourd; or some other object that can withstand being passed around the class multiple times. Choose something to put in the center of the circle; a piece of decorative fabric placed on the floor or a low table, with flowers or other beautiful objects. The talking piece can rest here until it is used. Prepare a poster of the circle guidelines, or write the guidelines on the whiteboard. Before you begin your circle, give a clear, simple and honest explanation, using your own words, about why the class will be meeting in circles. If you are completely transparent about the purpose and goals the students will be more likely to trust the circle. Give students step-by-step instructions for how to move into the circle. We do not provide a suggested script for this because it will vary depending upon your situation. Because every class has a unique configuration you will have to develop the sequence of steps that works best for your class. Be especially vigilant about having students move their chairs safely; it may be helpful to discuss this and demonstrate prior to having them move. After students are seated, place something in the center of the circle: a colorful piece of cloth can be placed on the floor or a low table, and decorated with flowers or a small bowl containing water or stones. Do this in a mindful manner, with a touch of ceremony. Return to your seat and read an appropriate poem or ring a bell. Announce that the circle has begun. “Tell about a time you have met in a circle, such as around a dinner table, campfire, for a game, or in other classes or situations. Take turns sharing, going around the circle.” OPTION: Choose another question from the list of prompts on page 12or use your own prompt. Describe the following four circle guidelines. Speak from the heart: This means speaking for yourself, talking about what is true for you based on your own experiences. When we speak from the heart we are aiming for eloquence, for choosing words that accurately communicate what we hold to be important. Listen from the heart: We are used to judging other people. Sometimes without even knowing anything about another person we will make assumptions about them. These assumptions can keep us from really hearing what they have to say…and what they have to say may be something important and helpful. Therefore, when we listen from the heart we are trying to set aside any assumptions and judgments we may hold about the person. This opens up the possibility of making wonderful discoveries about each other. This activity teaches respect for the talking piece. It invites sharing from imagination. Everyone gets to practice silence, and they experience speaking toward the center of the circle. For this activity choose a talking piece that has an interesting shape and textures, such as a piece of driftwood gathered along a seashore or riverbank. “When we speak, we speak into the center of the circle, adding our voice and our wisdom to the voices and wisdom of everyone else." Demonstrate passing the talking piece by passing it first with the person sitting next to you, and having them pass it back. Next, pass it around in silence. As each person receives it, ask them to hold and look at it until they notice something about it…something they see in it, or something that it reminds them of. Do another round in which each student can share what they saw in the talking piece. Ask them to speak into the center. Don’t use a talking piece for this; invite brainstorming. This approach will help to clarify any questions that students hold about agreements.